The Poi Bowl race on July 3rd – 9.5 miles on the famous Maliko run. 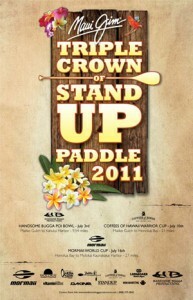 The Coffees of Hawaii Warrior Cup on July 10th – 21 miles from Maliko Gulch to Honolua Bay. Connor Baxter continued his stellar form to win all three events, though he was pushed the whole way (over three hours) in the World Cup by Dave Kalama. The consistently strong Livio Menelau finished second overall, after picking up 2x thirds and a second. While Andrea Moller dominated the women’s side, comfortably winning all three events.